At Have1.com we offer complete sign production & installation services, indoor and outdoor signage, large format digital printing, vinyl lettering and decals, vinyl banners, vehicle graphics and wraps, lettering & more. From window graphics, murals and banners, to dimensional and way finding signage, Have1.com offers many unique ways to display your promotion or branding. Digital printing has brought forward so many new and creative ways that we are able to advertise outdoors and create eye-catching spaces for businesses. We offer design, large format digital printing and installation services. Browse through some of the professional sign projects we have completed in the past. Showcasing everything from custom out door signs to custom job signs. 4 MM / 6 MM / 10 MM Coroplast signs are lightweight and durable. These signs are excellent for outdoor use as they are a tough, waterproof, plastic sign material. Available as full colour single or double sided signs. 3 MM fully customized aluminum composite signs. These signs are a sturdy, long lasting, weather resistant alternative to coroplast. Available both single and double sided as well as vertical or horizontal format. Coroplast Job Site signs are lightweight and durable. These signs are excellent for outdoor use as they are a tough, waterproof, plastic sign material. Available as full colour single or double sided signs with horizontal or vertical Flutes. Custom full colour digitally printed Vinyl Banners – perfect for indoors or outdoor use. 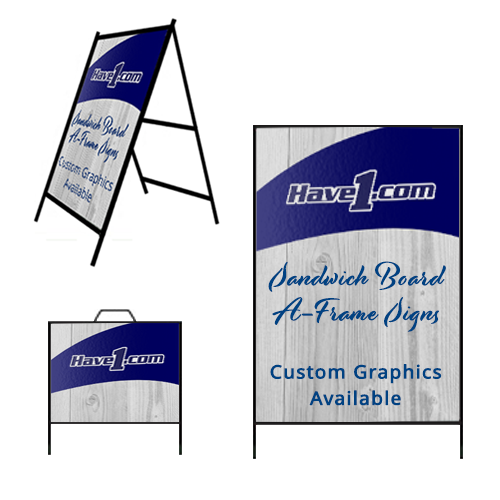 Great for sponsor recognition, temporary signs, advertising specials, trade show displays, and much more. Available with nickle grommets to hang your banner. We print graphics onto view-thru film that enables the graphics not to obstruct your vision when looking through from one side, while offering a full colour graphic from the other. Ideal for use on vehicle windows as well as building windows and glass doors. Durable outdoor vinyl decals printed directly onto outdoor vinyl material at high resolutions in full colour. We offer lamination services to have your vinyl decals protected from scratching, UV fade resistance, and waterproof / weatherproofing. Our popular full colour giant presentation cheques and re-useable dry-erasable giant presentation check signs – printed in full colour. We can design the graphic for you or you can supply us with a print ready artwork file. Made from light-weight, yet very durable material. These signs are waterproof and UV protected. Use your own photograph or have us design the sign for you. Our special outdoor signs are available in many different shapes and sizes – including custom options. Our high-end plastic Signicade® Econo & Deluxe A-Frame sign holders are a very popular option as they are heavier and more wind resistant. Change signs in seconds with the patented “Quick Change” feature – signs easily slide in and out. These signs can be used both indoors and outdoors. Excellent for attracting attention to special offers or sales your store might be have. The full colour A-Frame signs are one of our most popular type of signs. Stylish outdoor hangers made entirely of metal. One, or Two, piece frames allow for simple setup and handling. These sign hangers are machine cut, welded, then powder coated black to withstand the elements. One, or Two, piece frames allow for simple setup and handling. Available in two heights, 48″ or 54″. These frames are machine cut, welded, then powder coated to handle the elements, making them perfect for outdoor use. 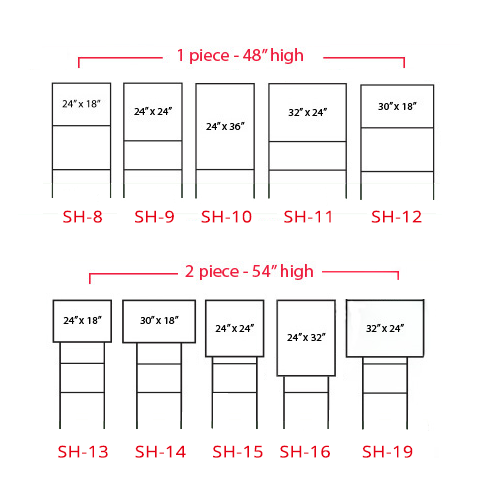 Step Stakes, also commonly referred to as H-Stakes, are recommended for corrugated signs up to 10″ x 30″. Available as regular (SS-1) or heavy duty (SS-2). Perfect for Job-site or Real Estate signs. A great way to attract attention to your company’s sign – the popular Wind Spinner sign is powered by any gust of wind. 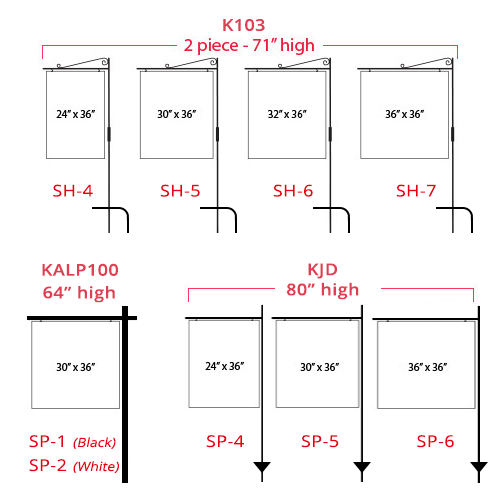 Graphic insert size of 18″ x 30″ with an overall height of 42″. Available with or with out graphics. These durable aluminum panels have rounded corners and are available in a variety of sizes. Each panel is treated with a white baked enamel finish on both sides for added durability and accept both cut vinyl and printed graphics.